I'd like to stick to *free* resources unless absolutely necessary, so I knew right from the start that Minecraft wouldn't work. Still, I wanted to "give it a go" and see what the hype was all about. I must say that I found the Minecraft PE LITE version useless...I pretty much walked around, made a house and then killed some zombies (with 1-2 swings) after dark. No Flow, no Fiero. Still, I know that the paid version has great applications for the (ancient) Language-learning classroom. One Unit/Lesson I'd like to see would include reconstructions of ancient sites like Pompeii using what we've already excavated as a guide. Since there's a ton left to be discovered, it would be great to see student-driven concepts of what is left. Once complete, I see this as the classes' virtual space in communicating with the ancient world. Very cool. Those shortcomings could be documented by students as a writing assignment, though: a systematic technical document, created painstakingly and collaboratively. I have the Minecraft app installed - tried to play it but got distracted. Then I tried on the laptop (demo version)and could switch to video tutorials. The bigger screen and being able to multitask with the video helped me to get started. I have not brought this into my classroom but really want to try. The kids keep asking for it as part of the curriculum. I have a lab with desktops and no mobile devices yet. There is a version for schools at a reduced price. Not sure I could swing that with all the demands on the budget. I also found a site on curriculum. I haven't explored it yet but from a glance, it looked worthy of at least a bookmarks. I found it interesting that Trish Cloud had her student blogging with signs in Minecraft. I learned in the Graduate School of Public Administration in an Organizational Theory class that there was always other options, that it is perfectly acceptable to take no action or to simply say, "I don't know." I have always been one to say in answer to a question from a student that, "I don't know." In the old days I used to say, "But I will find out and get back with you the next class." Now I can say, "Ah, I don't know, someone look that up for us." Soon a hand or two raises, since all my classes are in computer classrooms, my choice. I teach social science classes so easy to get those rooms too... at least for now. I have Minecraft PE on my android phone and a copy of Minecraft Edu to evaluate. The first thing I did was watch a slew of videos on using Minecraft in the classroom. There are several playlists available, this one has a great example of studying reaction times in science class: http://www.youtube.com/playlist?list=PL89DD8A0A56281731. There is also a YouTube channel called Minecraft Teacher: http://www.youtube.com/user/MinecraftTeachr. I have downloaded some world maps and loaded them. TutorialWorld is awesome for bringing in noobs and learning to navigate. I've problems getting the maps to work on my phone and need to follow up on that. The Edu version has a Peaceful mode with no ghools. That makes it great for an exploration platform for younger students. I'm hoping to start off with an after-school club and try to get teachers to drop by and see what's happening. The Edu version has a great management interface so the teacher can teleport a class to a spot, or freeze them in place, if necessary! One of the best applications I have seen and it was for the level of students interested in The Hunger Game, where the instructor built a world in Minecraft, and hid food item all around the world, had all the students "spawn" at the main location and go out and look for food and bring it back to the collection point. Quite a lot of work for the instructor, after all it is "mine" and "craft" and you can make different food items as well as the natural ones like kill a cow and get a steak (and sometimes a hide), or find a mushroom or pumpkin for example. The problem with just "dropping" something like a tool, is that after a time it de-materializes. These food items don', nor do anything you constructed. I could also see an instructor creating the portal needed to get to the "netherworld" which is all underground and kind of scarey. . . and have students write or discuss the similarities and differences about the two worlds. You could have students create personal worlds in different environments (arctic is a bit harsh, hard to find bamboo... need it I think for paper for books) or a tropical or mountain or desert one. It is random the world assigned but you can save it. This is all playing in "peaceful" mode. It is my understanding the person who controls the server for a multi-player Minecraft can set the limits, like make sure someone couldn't pour lava over your house and destroy it, for example. And also set the level to peaceful. Depends on the end wanted by the instructor and the goals and objectives. So today I was looking over some of the content in Kevin Werbach's Gamification MOOC (enrollment just started Monday (4/1) and he is extending week 1 content for those who join late, so if you want to join in it is not too late). One thing he brought up in his 2.3 lesson is that Games have the perfect balance between structure and exploration. While PE contains exploration it lacks the structure (rules) that exist in the Desktop version. Part of the fun of a game is to force yourself to follow a set of rules - if they are too hard or too easy it takes away the FFF (Fun, Flow, Fiero). Some of those rules can be self-imposed, though. There are entire communities built around the idea of getting through the early Thief games without alerting a single A.I. enemy. Pages and pages of content were dedicated to explaining exactly how to "ghost" a level. Talk about "flow"! I have to agree about PE lacking the rules. Without the hunger motive, I can just sit all day in my little dirt room and be perfectly safe. I have no real reason to go out and explore. Of course I might simply out of curiosity's sake, but then struggling with the controls discourages me further. I agree Leedale, I have been tempted to sit in my little dirt room LOL. Or my nice waterfront compound and watch my nine dogs romp around. . . I have struggled with the controls some in the Minecraft PE. Since you are allowed to set your level of difficulty, creepers after you is motivation, you can push yourself. Minecraft doesn't have an "end game" or getting the "holy grail" at the end of the game and it is over, so if it is used constructively in educational settings, certainly geometry, accounting, engineering are easy to encourage and justify, however for content specific, I think it would have to have a mostly pre-built world with some kind of a quest, like the instructor did for the hunger games. It was much easier to have my students design a world (island) for Second Life and have techies help pre-build it, then let them all go in and evaluate it while the techies are also in there, suggest changes, see those changes made and then actually get together for their "class picture" in the Day of the Dead Island than to tell them to go into Minecraft and create a Day of the Dead environment. 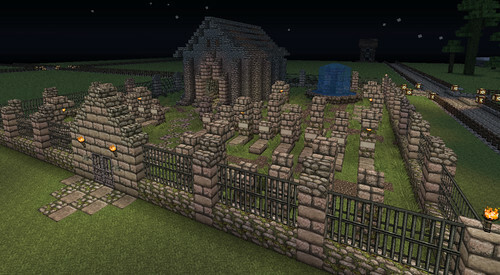 Here is an interesting take on a graveyard from a Minecraft forum and there are great examples of churches in the forums too. In Minecraft PE for iOS, you do have rules. Night and day occur, your health depletes, and there are zombies, creepers, and spiders. You have to select survival mode, but I believe that almost all of the rules of the desktop version are included in the PE.